With more than 3,000 Facebook members and a team of dedicated volunteers, every day, dozens of Protect Sudbury members contribute in some way – posting on Facebook, donating to the legal fund, attending an event, or talking to their neighbors about Eversource’s transmission line proposal. One of the most important aspects of this effort is our letter writing campaign. We know from our short experience that letter writing works. Sudbury citizen-contact has prompted numerous responses from key town and state offices, and environmental groups, amplifying our collective voices. 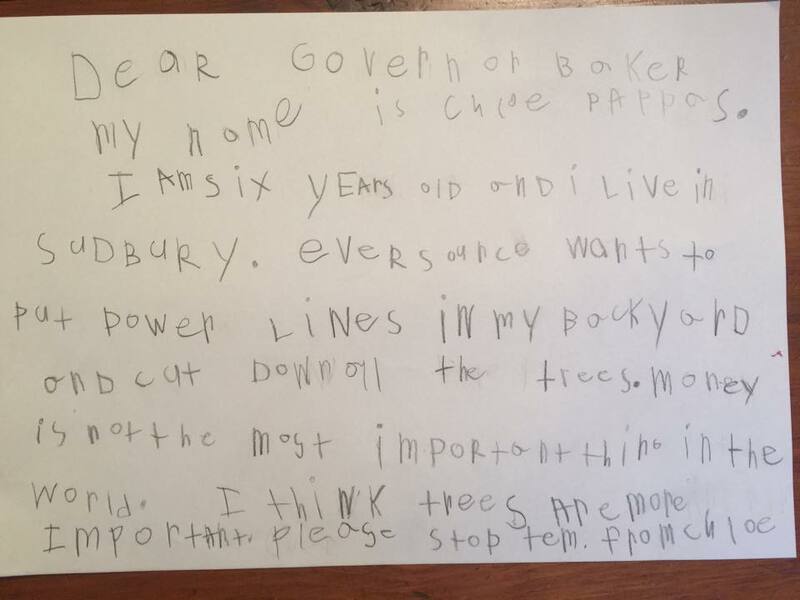 Letters from Sudbury citizens prompted the Board of Selectmen to clarify their stance on opposing the power lines: “the Board of Selectmen has voted unanimously to oppose the Eversource Sudbury to Hudson Transmission Reliability Project.” After being contacted by their Sudbury constituents, State Senator Eldridge and Representative Gentile wrote to the State Office of Energy Affairs and Department of Public Utilities, saying “…what price do you put on the clear-cutting and despoiling of precious conservation land, beautiful views, ecological diversity, and taxpayer-funded open space?” Just last week, Protect Sudbury Board Members had a meeting with Energy and Environment Secretary Matthew Beaton because, you guessed it, he received letters from concerned Protect Sudbury members. 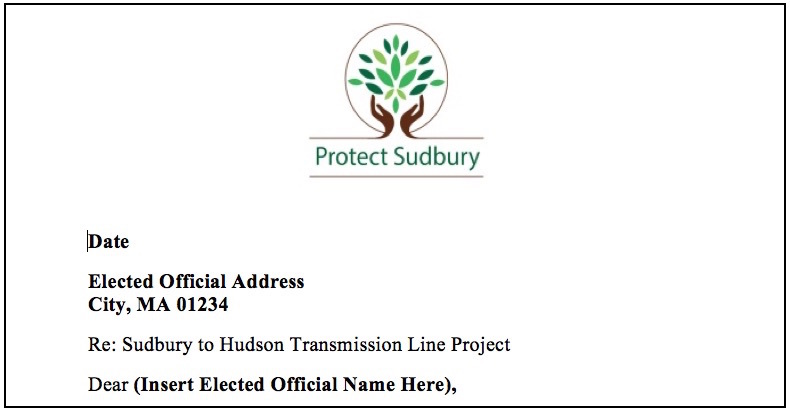 Eversource is counting on our losing heart and giving up; they actively court the idea that the transmission lines through the heart of Sudbury are a foregone conclusion. But we won’t lose heart, we won’t give up, and Eversource’s project is not a foregone conclusion. If you haven’t written a letter yet, now is the time to pick up your pen or start clicking your keyboard. If you already have, bravo! It’s time to write another one. It’s easy, takes no special expertise (we have examples and templates for you to use) and it really does make difference. Senator Elizabeth Warren: As the senior Senator for Massachusetts and a high profile national figure, her support would provide visibility for Protect Sudbury and further legitimize our opposition to Eversource’s proposal. Senator Warren has consistently shown her concern for environmental and community issues, and has been an outspoken opponent of other ill-conceived utility projects, in particular the recently defeated Kinder Morgan Pipeline. Please contact her via her website. If you feel inclined to contact her more than once, you can tailor your letters for different subject areas – energy, the environment, health, or historic preservation. Mass. State Senator Mike Barrett (Sudbury precincts 1, 4, and 5). Let’s get Senator Barrett on board along with Senator Eldridge and Representative Gentile. If you’re in his district, please call his office at 617-722-1572, write to him at 24 Beacon Street, Room 416, Boston, MA 02133 or e-mail him via Mike.Barrett@masenate.gov or via his website. When you’ve written your letter, post or tweet and let the Protect Sudbury community know. The Declaration of Independence was basically a letter to King George and look how that turned out? Let’s go 01776.